Originally from Northern Ireland, Miriam Gamble lectures in Creative Writing at the University of Edinburgh. 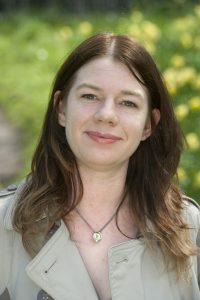 Her collections are The Squirrels Are Dead (2010), which won a Somerset Maugham Award, Pirate Music (2014), and What Planet (forthcoming, May 2019), all published by Bloodaxe. She has been a mentor on the Ledbury Emerging Critics Programme and a judge on the Seamus Heaney Centre Prize and the Saltire Poetry Book of the Year Award. Miriam also writes essays; recent pieces on Janet Frame and D.H. Lawrence have appeared in The Dark Horse. She was a 2017 International Literature Showcase writer. than they do in other places. the kitchen suddenly quaintly Victorian. and an angry conger eel exits its haunt.